This is a group blog covering the National Association of Science Writers (NASW) workshops, set for Saturday, Nov. 6, at ScienceWriters 2010 (Nov. 6 to Nov. 10) at Yale University in New Haven. Bloggers here include most of the NASW graduate travel fellows and NASW freelance travel fellows. Science writers aren’t just learning to write anymore; in these digital times they want to learn about Web video. Confession: I stole that lead. It’s the opening narration for a short video produced and directed by volunteers who attended the NASW workshop “Producing video, on camera and off.” Instructors Christie Nicholson, freelancer and online contributor at Scientific American; and Eric R. Olson, audio-video editor at the Nature Publishing Group; walked us through the process of composing and shooting several quick interviews. Then they showed us how to organize the shots and add narration. “It’s not rocket science,” Nicholson reassured us. Olson passed around a surprisingly small equipment kit, used for making Web videos at Scientific American, which contained a Kodak camera and microphone. (A Flip camera is an alternative to the Kodak model.) The other two essentials: a tripod and editing software such as Final Cut Pro or iMovie. Price for everything: only about $200. We looked at some examples of videos that worked well, such as Carl Zimmer’s cuttlefish-bites-man story [http://www.youtube.com/watch?v=mW4PbW893ik]. The most important elements of a good video story, the instructors explained, are action and engaging characters. So where is the amazingly cool video that my classmates and I produced? Unfortunately, there wasn’t time for the other two crash courses we need to become full-fledged video producer/directors: doing an actual shoot of a real event, and editing our material in post-production, but those would make great sessions for ScienceWriters 2011. 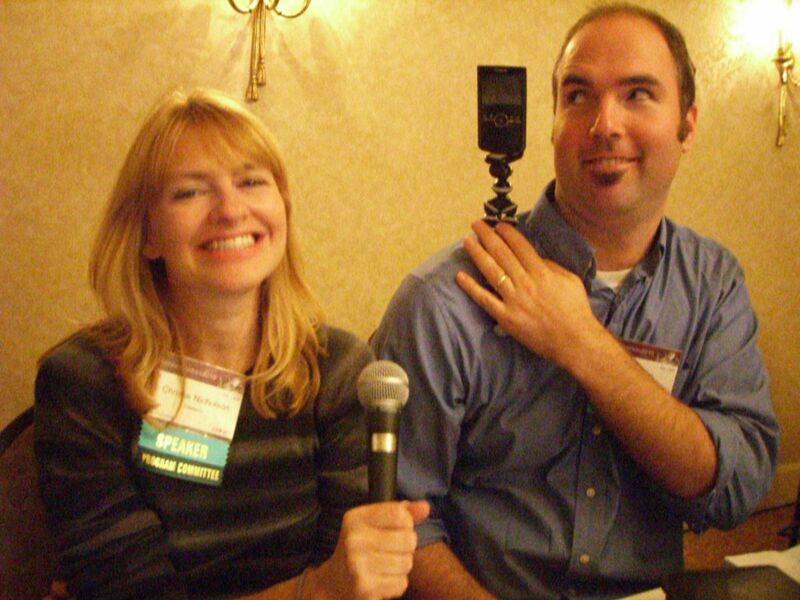 Image: Nicholson (left) and Olson with the video reporting essentials: microphone, camera and Gorillapod. I'm afraid that $200 will buy a camera, a lavaliere mic and a (small) flexible tripod. FinalCut will run you another $200 to $1,000, depending on the edition you buy. Final Cut Express is a stripped-down, but more capable than iMovie, non-linear video editor. Final Cut Studio is full-fledged professional suite, including sound editing, animation, effects, compression, and DVD mastering tools. Of course, iMovie comes free with Mac and is usually enough to do simple cuts, titling an transitions, which is enough for most of us. Thanks for the clarification Peppahmink. I'm a Mac person so I wasn't aware of the extra cost for Final Cut. Please check out the other blog posts about the "producing video" session, which have additional info about equipment and production tips. How do we reveal the hidden patterns in data? Looking for a story? Try a spreadsheet. Who Wouldn't Want to Experiment in New Media? Online commentary: more than just noise?